Create lasting memories at your 13th Birthday photo booth with this deluxe set of 41 props! Designed with care in the USA and backed by a 100% satisfaction guarantee! Beautiful creative pictures are the perfect way to remember your special day becoming officially a teenager. That's why our deluxe set of 41 13 themed photo booth prop cutouts is the perfect addition to your 13th bday festivities! - 1 "Grab a Prop and Strike a Pose" sign to make sure your guests join in the fun! - Plenty of adhesive strips supplies to make assembly a breeze. Set up the included "Grab a prop and strike a pose!" backdrop sign with the thirteen theme cutouts to make sure your guests don't hesitate to join in the fun and games. With 41 unique props and endless possibilities, you, your friends and family will be sure to laugh and smile as you create lasting memories together. 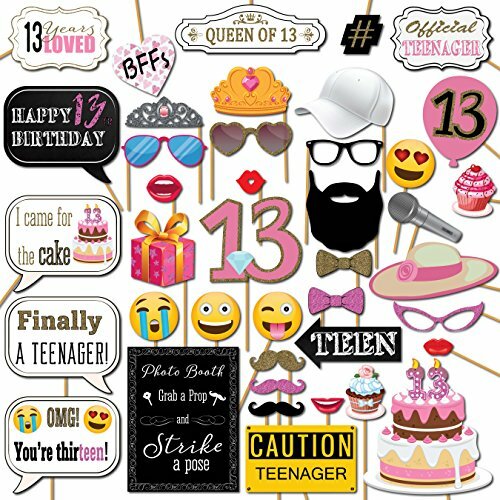 -Attach to the wall for perfectly themed girly thirteenth birthday decor. For the best in photo booth fun, order yours today! If you have any questions about this product by Outside the Booth, contact us by completing and submitting the form below. If you are looking for a specif part number, please include it with your message.